Seeing animals in the wild is always going to excite children of most ages. We find that children from about 7 years upwards get the most from this experience, though younger kids will also always find something that they find fascinating. Sometimes though, it is good to add something more active to their experience, especially activities which help them realise that the wilderness they’re in is home to many people, and these tribes have a very different way of life from their own. The Warrior’s Academy is the perfect way to give families with children an insight into the wildlife and wilderness as seen through the eyes of Maasai or Samburu tribesmen. There is a strong educational flavour to this experience, but it won’t seem that way to the kids ”“ they’ll just have fun! Activities will be tailored to the ages of the children, but the key is that a warrior (moran) will be your guide and it will be the relationship with the warrior and other tribes people which will make this so special. So what will you actually be doing? You could find yourself learning to make fire, tracking wildlife, exploring the plains on foot, being told stories of Maasai bravery, making bead artifacts such as bracelets, having spear-throwing contests, practising with bows and arrows, finding out about the customs and traditions of the Maasai or Samburu people, herding cattle, milking goats, learning how to ”˜read’ the wilderness in terms of footprints and plantlife ”¦. There is always something to get you involved with or show you. At Tribes, we’ve always believed that learning about a place through the people who live there is the most exciting and memorable way to enjoy a new destination. The Warrior’s Academy is eye-opening and great fun. We can offer this experience in Kenya’s Samburu and also in the Masai Mara, based at the safari camps run by Saruni (Saruni Mara and Saruni Samburu). This experience is offered in Kenya. It is best to avoid the rainiest months of April and May when the long rains occur. November is the short rains season, so you might want to avoid this too, but actually it can still be a good time to come and it tends not to rain all the time. The Warrior’s Academy experience can be tailored to you and your family. It can be anything from a half day to 3 days. 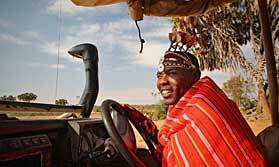 It does not cost any extra on top of your safari and you can do this at both Saruni Samburu and Saruni Mara. There is a trip we offer which combines both of these destinations ”“ Saruni Samburu and Mara ”“ which would be ideal to for this experience, but we can tailor make whatever you like.